Mumbai Police has once again brought movie reference to educate the citizens. Their latest aim is to stop the growth of fake news. It is quite evident that with the growing use of WhatsApp and other social media platforms, people are not verifying news and simply posting fake news. Lack of verification sure gives rise to several rumours that in return create chaos. Hence, to ensure that the cycle is broken and people are able to differentiate between true and fake news, the Twitter account of Mumbai Police has come up with an interesting tweet. Their tweet reads, "All good things to those who wait’ to verify before sharing #KillFakeNews #verifybeforeyoushare #sochkesharekaro" With the tweet, they added a picture of Hannibal Lecter from the iconic Hollywood film, The Silence of the Lambs. 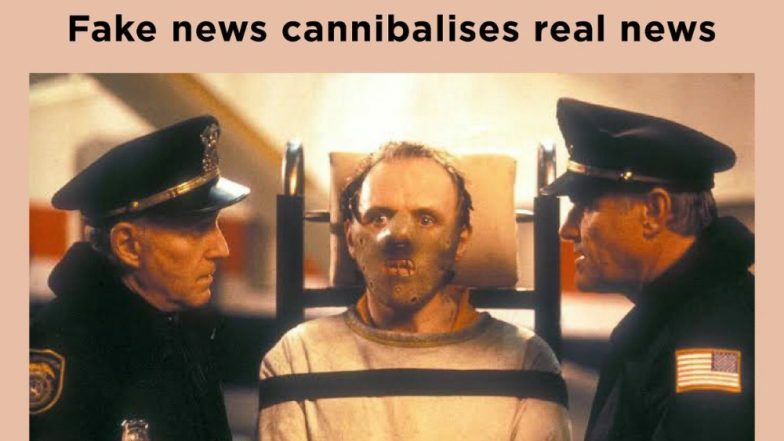 The photo also has a caption that reads, "Fake news cannibalises real news." For the uninitiated, Hannibal Lecter's role is played by Anthony Hopkins in the 1991 psychological thriller. Lecter is actually a cannibal in the movie who has been ordered to apprehend another serial killer claiming female victims. While the movie does sound every bit creepy, the reference chosen by Mumbai Police is quite interesting. You can check out their tweet below. In the past, the Mumbai Police has often used movie or real-time news references to educate the citizens. Some might even say that the Mumbai Police's Twitter account is every bit savage! Sharing concerns of the citizens, the Twitter account sure livens up everyone's feed with their witty updates.